India's veteran cricketer Yuvraj Singh has had a tough couple of seasons even at the domestic level since he last played for India. After announcing his ODI comeback after more than three years with a stunning 150 in January 2017, Yuvraj followed it up with a match-winning knock against Pakistan in the Champions Trophy. But the star all-rounder was shown the door soon after India failed to defend their title. The ouster was disheartening for Yuvraj, who was making a comeback for the umpteenth time in his career. When he was recalled for India's T20 leg on their Australian tour in early 2016, he was playing international cricket for the first time in almost two years. At that point he had talked about how it is never easy to go back to the domestic level, and prove your worth to the selectors every time. Having played for India since 2000, Yuvraj featured in three 50-over World Cups, six T20 World Cups, four Champions Trophies and plenty of other Test, ODI and T20 tournaments. He won many laurels for the country, but his biggest moment came when he won India the 2011 World Cup, bagging the player of the tournament award in the process. Yuvraj's first big setback came when he was overlooked for the 2015 World Cup squad, even after scoring three back-to-back hundreds in the Ranji Trophy. He knows how important another World Cup victory is for India, and continued trying to break through to the side - in time before this year's World Cup. But Yuvraj's dream of winning another World Cup seems over after India announced their squad, which can now be altered only in case of an injury. Meanwhile, Ishan Kishan is a big player for the future. He is certainly a star in the making and was even in the reckoning for national selection, but was narrowly trumped by Rishabh Pant. Kishan has all the qualities of becoming a T20 mainstay, if not being India's future wicketkeeper batsman in the longer formats as well. Yuvraj, on the other hand, is clearly nearing the end of his career. Kishan is as much younger than Yuvraj as the gap between the latter's first ODI and his last yet - 17 years. A last-minute selection in one of the most successful IPL franchises during last month's bidding came as an oasis amid a desert for Yuvraj. The southpaw looked excited, and trained hard for what appears to be his final outing at the IPL. Yuvraj's inclusion in Mumbai Indians' first match this season came as a shock to many, especially since he was a last-minute pick. But Yuvraj surprised everyone by scoring a quickfire 53 while the rest of the batting order collapsed. In the team's next match, Yuvraj decided to throw the kitchen sink, hitting India's star spinner Yuzvendra Chahal for three sixes off the first three balls of his over, before holing out to a boundary catch while trying to hit a fourth one. His next innings of 18 off 22 balls at his Ranji home ground Mohali drew much criticism, and a quick dismissal in his last game against Chennai was just what Kishan needed to get his foot through the door. Many experts felt Yuvraj would come into the side later to replace an international player, rather than featuring in the starting XI right at the start of the IPL 2019 season. That, however, has not been the case. Since being drafted in, Kishan has not impressed much either. His returns so far (50 runs from 4 innings) have in fact been only half as good as Yuvraj's (98 runs from 4 innings). 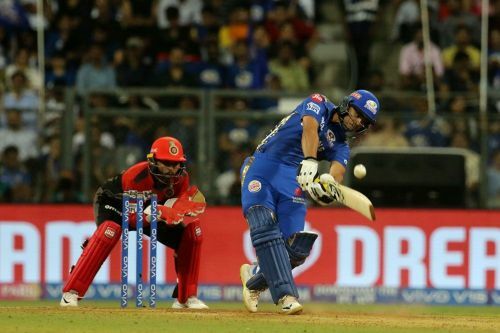 Kishan's strike rate of 116 - which was helped by a quick cameo in yesterday's match against RCB - hasn't been great either (Yuvraj's strike rate this season is over 130). Kishan has batted at different positions (including Yuvraj's number four), but has only managed a highest score of 21. Still, the youngster is likely to get an extended run, even if Yuvraj's fans are not happy about that. Mumbai Indians are looking to make it to the playoffs, and are currently in the top half of the IPL points table so they seem on the right track. But Kishan seriously needs to contribute more towards his team's success. It is fair to say that Kishan was under heavy pressure after coming into the side to replace a legend like Yuvraj. But now that the selectors have shown enough faith in his abilities, he can't afford to keep taking his own time to deliver. Even Yuvraj, who also plays the role of a mentor, would be hoping the best for his side. But by now, both would know that the number of chances you get to fail is always one less than what one would hope for.